How ought such a natural history of destruction to begin? With a summary of the technical, organizational, and political prerequisites for carrying out large-scale air-raids? With a scientific account of the previously unknown phenomenon of the firestorms? With a pathological record of typical modes of death, or with behaviorist studies of the instincts of flight and homecoming? Indeed, it seems that no German writer, with the sole exception of Nossack, was ready or able to put any concrete facts down on paper about the progress and repercussions of this gigantic, long-term campaign of destruction. 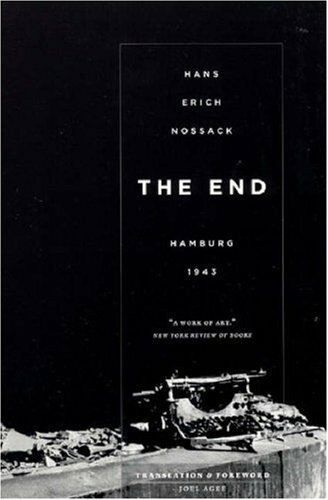 Sebald particularly praised Der Untergang, Hans Erich Nossack’s account of the July 1943 firebombing of Hamburg, which was included in a group of stories in a book called Interview mit dem Tode (Interview with Death), first published in Germany in 1948. Probably because of the attention it received in Sebald’s book, Der Untergang finally appeared in English in 2004 from the University of Chicago Press, translated by Joel Agee and retitled The End: Hamburg 1943. By sheer luck, Nossack, a writer living in Hamburg in 1943, took his first vacation in years on the very week that the city was firebombed by Allies. Staying in a small rental cottage within sight of the city, Nossack witnessed the days of bombing and the ensuing flight of survivors before making his way back into Hamburg to see if anything was left of his home and office. At the outset, Nossack identifies himself as a “spectator,” an observer who used his location at the fringe of events – rather than at their center – to his advantage. There was a “danger,” he said, at “knowing the entirety.” Though his writing vacillates between the utterly precise and the casually impressionistic, Nossack uses his relentless sense of observation to try to understand the survivors, who, because of their experiences at the center of the firebombing, stand on the other side of “an invisible abyss.” “Why didn’t they cry and lament?” It seemed to him that “shelter, food, and clothing basically didn’t make any difference at all.” At this level, Nossack’s enterprise of trying to comprehend this horrendous experience from which he was largely exempt is not unlike Sebald’s own attempt to slowly excavate the damaged lives of Jewish survivors of the Holocaust in The Emigrants. But Nossack is more than an observer, he is also a moralist. Watching others applaud each time an Allied plane is downed, he declines to join in. “Now was no longer the time for petty distinctions as that between friend and foe,” he writes before quoting from Homer’s Odyssey about the unholiness of rejoicing over the death of enemies. But Nossack goes even further and confesses his own sense of guilt “in the city’s destruction.” Moreover, he suspects other Germans also secretly harbor the same sense of guilt, a theme on which he elaborates throughout The End. the season of the year, the weather, the observer’s viewpoint, the drone of the approaching squadrons, the red firelight on the horizon, the physical and mental condition of refugees from the cities, the burnt-out scenery, chimneys that curiously still remain standing, washing put out to dry on a rack outside a kitchen window, a torn net curtain blowing from an empty veranda, a living room sofa with a crochet cover, countless other objects lost forever, the rubble burying them and the dreadful new life moving beneath it, people’s sudden craving for perfume. Agee disputes Sebald’s claim. “These are not ‘plain facts’,” he writes. And he has a point. For, as one reads and rereads Sebald’s comments on Nossack, his position becomes ever more convoluted. In addition to delivering the “plain facts,” Sebald praises Nossack for the manner in which he delivers his facts. He approves of Nossack’s tendency to link “the sacred with the utmost profanity…a device that always proves effective.” Moreover, Nossack’s “narrative tone here is that of the messenger in classical tragedy.” Flipping and and forth between Nossack’s book, Sebald writing about Nossack, and Agee writing about Sebald, I began to think that the differences between Sebald and Agee are more semantic than substantive. Nossack, it seems to me, is not notable for his “plain facts” (although there are plenty of them) as much as for the telling details, which are something altogether different. One night, while taking shelter from the bombing in the cabin’s basement, Nossack knocks something over in the dark and it breaks. It was “a glass bowl that didn’t belong to us.” It’s a typical Nossack moment to register the brief concern that he has broken something that belongs to the cabin’s owner while all of Hamburg is on fire. Or to notice that some escaped pet parakeets have taken to sitting in the branches of a poplar tree. In fact, Nossack himself admits he didn’t remember much of what the survivors said to him as they fled. “It’s not really important,” he writes, as if what they might say was far less important than what they were doing. An unstated motif throughout Sebald’s essay appears to be a polemical claim for his own quasi-documentary aesthetic as the only responsible way to contemplate the bitter truth of historical memory. While Agee is correct here, I don’t think he should be in the least surprised. Writers and artists have always proposed their own aesthetic lineage (often through a process of misdiagnosing or creatively misreading the work of their predecessors) and they often find ways to leave a trail of breadcrumbs between themselves and those fore-bearers they most admire. Sebald practically said as much himself in Air War and Literature. It is with this documentary approach, which has an early precursor in Nossack’s Der Untergang, that German postwar literature really comes into its own and begins the serious study of material incommensurable with traditional aesthetics.